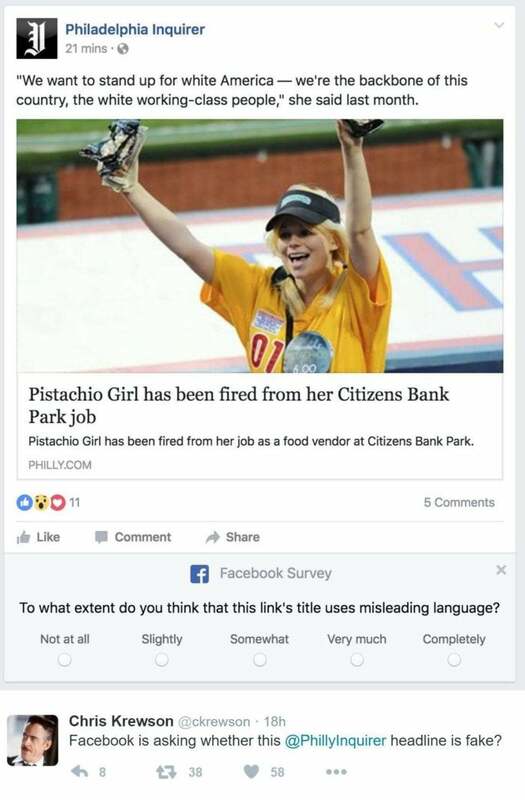 Facebook is turning to its user base to help solve its clickbait and fake news problems. Facebook has a big problem with fake news stories that are spread on the social network, and now it’s hoping users can help. People are reporting that Facebook is asking them survey questions to help determine whether news headlines are accurate. It’s not clear how many people are included in this survey or what, exactly, Facebook plans to do with the information it collects. Nevertheless, this appears to be part of Facebook’s plans to deal with the issues of clickbait and fake news that are plaguing the social network. “To what extent do you think that this link’s title withholds key details of the story?” reads one of the questions. While the second is, “To what extent do you think that this link’s title uses misleading language?” Respondents then have five responses they can choose: Not at all, Slightly, Somewhat, Very much, or Completely. What’s odd about these survey questions is that they are attached to posts from well known media outlets such as The Philadelphia Inquirer and Rolling Stone. Granted, there aren’t enough examples made public to see if less reputable sites are being polled as well. As we saw during our partisan news test on Facebook there are tons of fake news sites pumping stories into Facebook that the social network could poll users about. Nevertheless, it’s clear that Facebook is not automatically whitelisting established media organizations. That suggests the test, or at least parts of it, could be judging users just as much as they are judging news stories. After all, fake news and clickbait headlines spread because of users who either can’t tell when a news story is fake or aren’t reading further before sharing. And almost everyone is susceptible to sharing a fake story or something with a misleading headline. The story behind the story: Failing to dig further can sometimes have harmless results. In October, for example, people on social media—including some of my own friends on Facebook—shared news of the death of programmer Dennis Ritchie. The creator of Unix and the C programming language died in 2011, but people failed to check the date of the article and it didn’t take long for the news to go viral. The results of fake news are not always so amusing, however, as we saw recently with the Pizzagate shooting. It’s good to see Facebook making efforts to curb both fake news and clickbait on the social network. But it’s not remotely clear what the aims of this survey might actually be.